A wild horse drinks from a watering hole outside Salt Lake City. The dry conditions have led several groups to use extreme methods to protect the animals. Volunteer groups in Arizona and Colorado are bringing thousands of liters of water and truckloads of food to hard-to-reach areas in their states. But the local water supplies, called springs, have run dry and plant life has disappeared. Volunteers say this is the first time they have ever had to bring water to these areas. 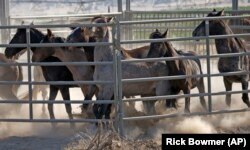 Federal officials have begun efforts to quickly gather groups of horses in desert areas of Utah and Nevada. A wild horse jumps among others near Salt Lake City. Dry drought conditions in parts of the American West are threatening wild horses and forcing extreme measures to protect them. As spring turned to summer, an extreme lack of rain, or drought conditions, turned from bad to worse, Netherlands said. Parts of Utah, Colorado, Arizona and New Mexico are under the most severe kind of drought. Government experts say extreme conditions also are present in areas from California to Missouri. Bryan McInerney is a water researcher with the National Weather Service, the government agency responsible for studying and predicting the weather. He said parts of the southwest region have witnessed some of the driest conditions on record. At the same time, there are high temperatures and low levels of water from melting snow. The federal Bureau of Land Management, or BLM, controls large areas of public land, mostly in the West. Agency experts say the problem facing wild horses is a result of their large population. The region is home to about 67,000 wild horses. The droughts have worsened the effect the horses have on their environment. Jason Lutterman is a BLM representative. He says there will likely always be problems with drought because it is common in the dry environment of the western U.S.
“What really exacerbates things is when we’re already over population, because then you already have resource issues,” he noted. The agency’s emergency efforts to collect wild horses in western Utah began in the middle of July. They aim to remove about 250 wild horses from a population of almost 670. The operation is expected to take several weeks. Once the horses are gathered, the government gives them medical treatment and offers them for sale or adoption. Those that are not sold or adopted are sent to private organizations that can care for the horses for a long time. A similar emergency collection began this month in central Nevada. Officials said some horses in a group of 2,100 could die from lack of water in coming weeks. Wild horses occupy a watering hole outside Salt Lake City, Utah. Volunteers are also taking action. Since late spring, Simone Netherlands’s Salt River group has brought hay to a many places near Phoenix, Arizona to feed starving horses. About 320 kilometers to the north, people near Gray Mountain, in the Navajo Nation, have started an effort to leave water and food for horses. The people say the horses would die without human assistance. Cindy Wright helped establish the Colorado environmental activist group Wild Horse Warriors for Sand Wash Basin. In western Colorado, her group of volunteers say they are preparing to bring up to 18,900 liters of water a day to a group of 750 horses. “Springs are drying up that have never dried up,” Wright said. “If we don’t have a very good fall with a lot of rain — and it’s also warm so that our fall vegetation grows — we’re going to lose horses. Aletha Dove helped Wright establish her group. Dove notes that areas of the Sand Wash Basin are low on food for wild horses. Dove said this is because the land is used to feed farm animals. So the group is bringing the water to others areas that have a lot of grass. Wild horses are held in a temporary holding structure after being rounded up the night before due to a lack of water to keep them alive. Activists supporting wild horses have criticized the Bureau of Land Management’s suggestions that wild horse populations are too big. Critics say the agency is using dry conditions as an excuse to reduce horse populations because of pressure from farmers. The farmers’ animals compete with the horses for the land and food. “I do have a concern about the larger numbers that they’re pulling off, and then a bigger concern about the BLM under this administration using all kinds of excuses to pull off horses,” said Suzanne Roy. She is the executive director of the American Wild Horse Campaign, an activist organization. The agency is currently not permitted to kill wild horses it gathers. But the administration of President Donald Trump has proposed permitting the animals to be killed or sold for their meat. Activists in Nevada held a demonstration earlier in July at the BLM’s office in Reno. They were protesting a horse collection planned for later this year. Activists want the government to use birth control to control wild horse populations. However, the horses must receive the fertility treatment yearly. And the treatment must be fired from a special gun at close distance. The bureau says is too difficult for use. BLM officials say the only exception is in cases where groups are easy to approach and the horses have markings making them distinguishable from one another. But, volunteers warn their efforts cannot go on forever. They say bringing in water and food could cost several thousand dollars each month and make horses dependent on humans. Julian Hattem reported this story for the Associated Press. Pete Musto adapted it for VOA Learning English. Mario Ritter was the editor. We want to hear from you. What do think is the best way to help the wild horses? Write to us in the Comments Section or on our Facebook page.